The DJI Matrice 600 has been labelled the “go-to drone for Hollywood cinematographers” and is definitively the best drone for aerial cinematography ever designed. 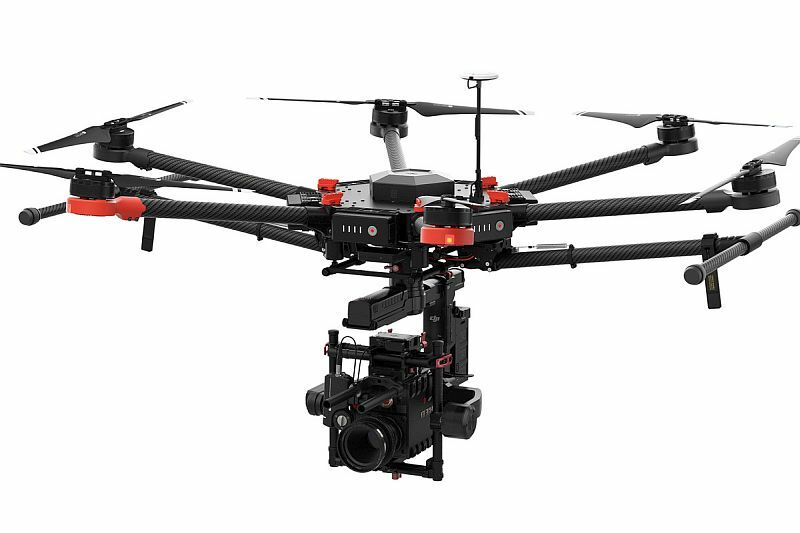 With a maximum payload of 6 kg, the heavy lifter comes with unparalleled camera and gimbal cross-compatibility. The Matrice 600 can carry a wide range of equipment, but is mainly designed for the RED Weapon and the ARRI Alexa Mini, with some good glass on. While carrying a heavy payload, the drone can stay in the air for long periods, flying for 18 minutes when carrying a camera (or up to 40 minutes without a payload). The hexacopter can fly at speeds of 18 m/s or climb at 5 m/s (reaching the UK maximum legal height for drone flight within half a minute). Meanwhile, the HD LightBridge 2 video downlink allows the operator to stream 1080p video at 60 frames per second at a phenomenal range of 5km. The Matrice 600 comes with the very best of DJI’s technology. The hexacopter uses triple modular redundancy and diagnostic algorithms to ensure it flies exactly as expected. Meanwhile, an advanced battery system, incorporating internal redundancy, significantly boosts safety – if one of the drone’s six batteries fail it automatically shifts the power supply while keeping the unit in the air. Furthermore, the drone’s smart propulsion systems and cooled motors make it easier to maintain, while handling lengthy shoots with ease. The Matrice 600 is ideal for all shoots – it can be set up in minutes and the IATO-compliant battery design means that it can be taken aboard airplanes, making it perfect for travel anywhere in the world. If you would be interested in using the DJI Matrice 600 for a shoot, please email us at info@beeaerial.co.uk or call on +44 (0) 333 772 0728.